The new Mercedes-Benz SLS AMG, which is about to celebrate its world premiere on 15 September 2009 at the In-ternational Motor Show (IAA) in Frankfurt/Main, embodies a blend of consummate automotive fascination and high tech. The super sports car delivers a compelling mix of purist styling, consistent lightweight design and superior driving dynamics. At the same time, the SLS fully lives up to all the expectations of hallmark Mercedes everyday practicality and optimum safety. In essence, the new 'Gullwing' offers the ideal synthesis of the strengths of Mercedes-Benz and AMG. The new super sports car from Mercedes-Benz and AMG makes for an al-luring proposition with its unrivalled technology package: aluminium space-frame body with gullwing doors, AMG 6.3-litre V8 front-mid engine develop-ing 420 kW/ 571 hp peak output, 650 Nm of torque and dry sump lubrica-tion, seven-speed dual-clutch transmission in a transaxle configuration, sports suspension with aluminium double wishbones and a kerb weight of 1620 kilograms based on the DIN standard – this superlative combination guarantees driving dynamics of the highest order. The ideal front/rear weight distribution of 47 to 53 percent and the vehicle's low centre of gravity are testimony to the uncompromising sports car concept. The 'Gullwing' accel-erates from 0 to 100 km/h in 3.8 seconds, before going on to a top speed of 317 km/h (electronically limited). The fuel con-sumption of 13.2 litres per 100 kilometres (combined) puts it at the front of the competitive field (all figures provisional). "Mercedes-Benz is presenting an exhilarating super sports car in the guise of the new SLS AMG, which is bound to set the pulses of all car enthusiasts racing that extra bit faster. The brands Mercedes-Benz and AMG have joined forces to create the SLS AMG – which is set to become one of the most al-luring sports cars of all time", says Dr. Dieter Zetsche, Chairman of the Board of Management of Daimler AG and Head of Mercedes-Benz Cars. 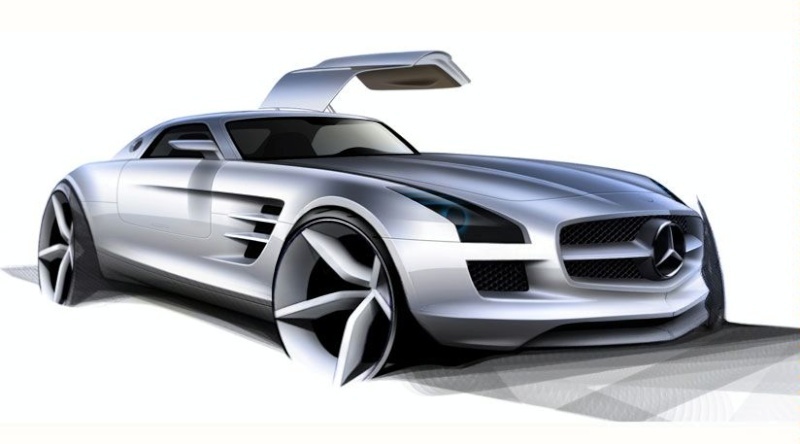 "Our customers will experience with the SLS AMG the expertise of Mer-cedes-AMG, built up over 40 years of motor racing. The unrivalled technol-ogy package delivers outstanding driving dynamics coupled with moderate fuel consumption figures – part and parcel of the modern-day AMG," says Volker Mornhinweg, Chairman of Mercedes-AMG GmbH. the SL. At the same time, the new SLS paves the way for the design phi-losophy of forthcoming Mercedes-Benz sports cars", says Gorden Wagener, Head of Design at Mercedes-Benz Cars. The distinctive styling of the new Mercedes-Benz SLS AMG enthrals with its passionate sportiness and reinterprets the breathtaking lines of the Mer-cedes-Benz 300 SL – one of the outstanding design icons of the Mercedes-Benz brand. With its purist design the new SLS AMG reflects the philosophy of contemporary sports car engineering: the bonnet which measures just under two metres, the low greenhouse positioned well to the rear and the short rear-end with an extendable aerofoil are just as powerful a reminder of the superlative dynamism as the long wheelbase, the wide track and the large wheels. The short overhangs feed through into the proportions, just as does the design of the super sports car with its low-slung front-mid engine set well back and dual-clutch transmission in transaxle configuration. 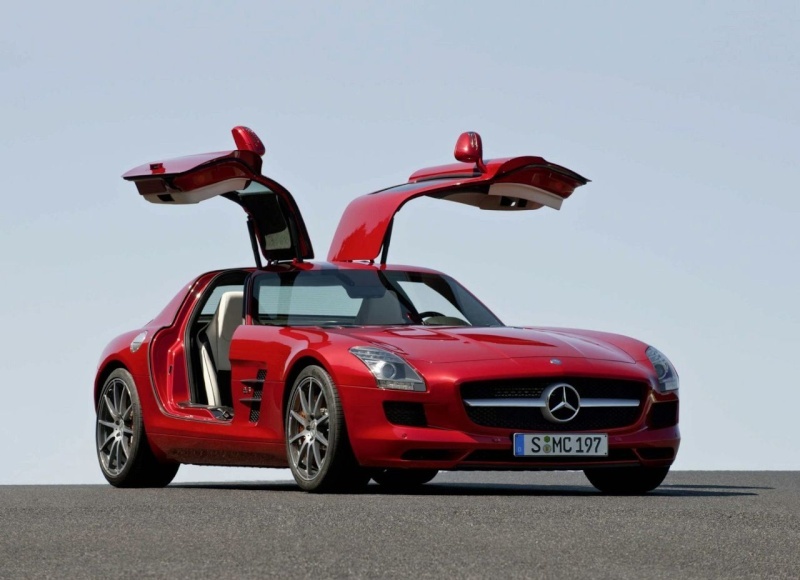 An un-doubted styling highlight comes courtesy of the gullwing doors which lend the SLS AMG its incomparable charisma – making a unique statement in this vehicle segment. The gullwing doors are not alone in rekindling memories of the Mercedes-Benz 300 SL; the hallmark wide radiator grille with the large Mercedes star and the wing-shaped cross fins are a throwback to the front-end of the sports car legend. The three-dimensional, sculptured front-end with its low-set, swept-back front apron set well into the sides lends the 'Gullwing' its powerful stance on the road. Six large cooling air intakes and the vertically arranged headlamps set well to the outside with their alluring inner ambi-ence provide a dominant aura: the central bi-xenon low-beam headlamp with its metallic wing section is framed at the top by two LED indicators and the LED daytime driving lights at the bottom. viewed from the side, as well as the long bonnet: as the eye is drawn for-ward, so the observer becomes more aware of the curve. The design of the four fins with their Silver Shadow finish that adorn the two air outlet grilles on the end of the bonnet create the same visual impression. These aircraft-style lines also visually accelerate the air that flows past – and make the SLS AMG appear extremely dynamic even while stationary. surface treatment, combines aesthetics with power. The compact passenger compartment proves as alluring as it is unmistakable. With its high beltline, low side windows and steeply angled windscreen it comes across as a kind of visor. The forward angled B-pillar with its stylish flowing sweep to the rear window exudes pure dynamism. Seen from the side, the eye is drawn to the prominent vehicle shoulder of the SLS, which stretches like a taut muscle from the front to the rear. Dis-tinctive 19-inch (front) and 20-inch (rear) light-alloy wheels fill the wheel arches, which stand out prominently from the sidewall. Three different wheel variants all provide a glimpse of the large high-performance composite brakes. Seen from above, a prominent, uninterrupted line runs from the muscle to the rear. This styling feature is also picked up on the bonnet where the eye follows a dis-tinctive contour which flows over the roof between the gullwing doors, right through to the third brake light. The rear view of the SLS also exudes dynamism and power: the gently slop-ing boot lid emphasises a sense of width, an impression reinforced by the prominent vehicle shoulder and the sleek tail lights: fitted with LED technol-ogy, the horizontally structured lighting units provide a scintillating view. Wing-shaped LED lighting elements ensure a distinctive, enthralling night design. The Formula-1-style LED fog lamp/reversing light is set down low in the centre. Similarly inspired by motor racing are the black diffuser insert and the two chromed tailpipes of the sports exhaust system. The strikingly tapered rear apron provides an unimpeded view of the wide rear wheels, lending the 'Gullwing' its self-assured stance on the road. The spoiler inte-grated in the boot lid is automatically deployed from a speed of 120 km/h to ensure optimum stability at high speeds. The colour charts for the SLS include nine exclusive paint finishes. The highlight comes in the shape of the unique "AMG ALU-BEAM silver" paint-work: the new, unique process makes the paint shine like liquid metal. The paint covers the body panels like a metallic skin, emphasises the scintillating design lines of the 'Gullwing' more strongly than any previous paint job and makes them even livelier by means of targeted light reflections. This effect is made possible thanks to tiny pigments measuring between 30 and 50 nanometres. The two matt finishes "designo magno allanite grey" and "AMG magno syl-vanite grey" are just as eye-catching: with their matt silk surface they rein-force the sporty character of the two-seater through specific contouring of the crease lines. You only need to open the gullwing doors on the Mercedes-Benz SLS AMG and ease into the sports seats to experience a whole new level of interior. The Mercedes-Benz designers took their inspiration from aircraft construction when styling the interior – immediately bringing an aircraft cockpit to mind. The characteristic styling feature is the dashboard, whose powerful and dramatic wing shape makes for an impression of width. Strikingly integrated into the dashboard are the galvanised air vents with their adjustable, cruci-form nozzles and Silver Shadow finish – their shape reminiscent of a jet's engines. The instrument cluster with its LED upshift indicator and two white backlit dial instruments add another decidedly sporty touch with their metal-lic Silver Shadow finish. The silver dials have red needles and a 360 km/h speedometer scale. As a central feature of the cockpit, the COMAND APS multimedia system with its 7-inch screen is integrated between the two cen-tre air vents. The elongated centre console in matt metal similarly picks up on the design theme of the aircraft cockpit. It is home to the AMG DRIVE UNIT, which is inclined towards the SLS driver and allows them to choose their very own vehicle setup. The E-SELECT shift lever, whose styling recalls the thrust control of a jet, controls the AMG SPEEDSHIFT DCT 7-speed sports trans-mission. All the controls are made out of solid metal, with a high-sheen Sil-ver Shadow surface.The concave inner panels of the gullwing doors, the high beltline and the powerful side sill panels round off the cockpit-like impression, while impart-ing a feeling of sports car-like ergonomics. Fine materials such as nappa leather, solid metal and (optional) genuine carbon-fibre facings underline the pronounced "custom-built" nature of the SLS interior, and show enormous attention to detail. Five different designo leather colours are available to meet individual prefer-ences: black, classic red, sand, porcelain and light brown. Despite the low sitting position of just 369 millimetres in typical sports car fashion, the wide-opening gullwing doors make it easy to get in and out of the vehicle. At the design stage great attention was paid to the widest possi-ble opening angle – it is a full 70 degrees. Equally importantly, the distance between the open doors and the road surface is a generous 1.50 metres, while the entry aperture between the open doors and the upper edge of the door sills measures no less than 1.08 metres. The entrance height, i.e. the distance between the road surface and the upper edge of the door sills is a very low 45 centimetres. As another important criterion for dignified access and egress, two gas-pressure struts positioned next to the door hinges re-quire only very little pressure when opening and closing the doors – even at very low ambient temperatures. The gullwing doors require less opening space than conventional coupé doors, and can be fully opened in a normal garage. The door is opened from inside by a handle finished in Silver Shadow. The grip section of the armrest moulded into the interior door panel ensures problem-free door closing. The operating buttons for the power windows, central locking system and exte-rior mirror adjustment are also located in the interior door panels for easy access. The feeling of comfortable spaciousness is in large measure due to the generous shoulder-room of 1483 millimetres and elbow room of no less than 1606 millimetres. In conjunction with the generous maximum head-room of 990 millimetres and effective legroom for the driver of 1058 millime-tres, the result is a low but extremely relaxed seating position. At the same time the intentionally steep angle of the windscreen ensures good all-round visibility for the passengers. The sports seat backrests are made from magnesium, a high-tech material that combines light weight with high strength. This leads to significant ad-vantages where weight distribution and a low centre of gravity are con-cerned. The sports seats feature so-called two-zone seat cushions. Promi-nent side bolsters with a harder foam filling provide optimal lateral support, while the inner areas of the seat cushion and backrest are softer for a high level of comfort on long journeys. In conjunction with the Memory package (optional), the fore-and-aft position, seat height, backrest angle, squab an-gle and steering column are electrically adjustable; three individual settings can also be stored. fluorescent or black piping provides another sporty touch. a button, the armrest can be moved in two stages to reveal a stowage com-partment underneath. This has two cupholders and the telephone cradle (op-tional), and a holder for the ignition key in the rear section. Other items can be stowed on the rear wall between the seats and in the parcel net in the pas-senger footwell. Two fixed clothes hooks are attached to the seat backrests, while those in the roof liner fold down and are silicon-insulated. The button to unlock the boot lid is located underneath the light switch. Al-ternatively the boot can be opened using the ignition key. The luggage com-partment can hold up to 176 litres. A made-to-measure luggage set is avail-able as an option, which enables the boot space to be used to full advan-tage. • Paintwork "AMG ALU-BEAM silver"
• Paintwork "AMG magno sylvanite grey"
• Paintwork "designo magno allanite grey"
The SLS is also breaking the mould when it comes to the body concept: for the first time, Mercedes-Benz and AMG are presenting a car with an alumin-ium chassis and body. Compared with the traditional steel design, this results in a significant weight saving, clearly illustrated in the DIN kerb weight of 1620 kilograms. of these aluminium sections ensure high resistance torque, thus providing the required direct transfer of drive, braking and suspension forces. The structure prevents unwanted flexibility; the vehicle responds rigidly, almost without twisting and directly. 45 percent of the intelligent, weight-optimised aluminium spaceframe is made out of aluminium sections, 31 percent out of aluminium sheet, 20 percent out of aluminium cast and 4 percent out of steel. Maximum occupant safety re-quires the use of ultra-high-strength, heat-formed steel in the A-pillars. The bodyshell weighs 241 kilograms – an absolute benchmark in the super sports car segment when compared with the peak output of 420 kW/571 hp. The entire vehicle concept has been designed to achieve a centre of gravity that is as low as possible. This applies both to the low connection of the powertrain and axles as well as to the arrangement of the stiffness-relevant bodyshell structure, which has been kept as low as possible. Examples in-clude the rigid flexural and torque connections between the front and rear section and the safety passenger cell, which have been realised consis-tently using force paths that are as low as possible. This results not only in a low centre of gravity but also a harmonious and, thus, efficient force path in the vehicle structure. absence of heavy secondary stiffening or supports. Passive safety of the very highest calibre Naturally, the aluminium spaceframe meets all the requirements in terms of passive safety and the hallmark Mercedes-Benz body quality that applies to any car sporting the Mercedes star. The best possible passive safety for the occupants is ensured by the standard-fit three-point seat belts, belt tension-ers, belt force limiters and eight airbags: two adaptive airbags and a knee-bag each are available for the driver and passenger. Two sidebags inte-grated into the seats and two separate windowbags that deploy from the door waistline are also available. A powerful eight-cylinder engine manufactured by Mercedes-AMG forms the heart of the new SLS. The fine-tuned 6.3-litre V8 engine develops 420 kW/571 hp at 6800 rpm, turning the SLS AMG into one of the most powerful sports cars in its segment. A power-to-weight ratio of 2.84 kg/hp comes cour-tesy of the low vehicle weight. The naturally aspirated engine delivers maxi-mum torque of 650 Nm at 4750 rpm. The 'Gullwing' accelerates from 0 to 100 km/h in 3.8 seconds, before going on to a top speed electronically limited to 317 km/h (all figures are pro-visional). Bearing the internal designation M 159, the V8 high-revving engine with its displacement of 6208 cubic centimetres has been thoroughly reengineered compared with the M 156 entry-level engine and boasts all the hallmarks of powerful racing engines. The use of high-strength components compensates for the increased en-gine load associated with the higher output. Forged pistons, a reinforced crankshaft bearing, optimised crankcase structure, along with improved lu-brication thanks to an on‑demand high-performance oil pump ensure opti-mum durability. Despite these higher loads, the engine weight for the M 159 has been further reduced. The forged pistons as oscillating masses play a particularly valuable role in this respect, resulting in a kerb weight of 205 kilograms and, in turn, a power-to-weight ratio of 0.36 kg/hp – an unrivalled figure compared with the competi-tion. Sophisticated catalytic converter technology enables current and future ex-haust emission standards such as EU 5, LEV 2 and ULEV to be met. Despite its uncompromisingly sporty character, the demanding fuel con-sumption targets have been met. The SLS AMG consumes 13.2 litres per 100 kilometres (combined, provisional figure), earning it a place at the top of the competitor rankings. Efficiency-enhancing measures include the familiar AMG-exclusive, friction-optimised twin-wire-arc-sprayed coating on the cylinder walls as well as the on-demand, map-optimised oil supply and intelligent generator management: during the engine's overrun phases and braking, kinetic energy is used to charge the battery, rather than being wasted by simply generating heat. This recuperation assists the driver not only during braking action but also helps convert the braking energy into electrical en-ergy. Conversely, the generator is switched to no-load operation during acceleration, thus reducing the load on the engine. The AMG 6.3-litre V8 engine delivers its abundant power via an ultra-light carbon-fibre driveshaft at the rear axle – similar to the set-up used on the DTM C-Class racing touring car. The dual-clutch transmission is mounted at the rear (trans-axle principle) and is connected to the engine housing via a torque tube. A carbon-fibre shaft rotates at engine speed in the torque tube. The advantages of this sophisticated solution are associated with the rigid link between the engine and trans-mission and, in turn, the optimum support for the forces and torque generated. A new AMG SPEEDSHIFT DCT 7-speed sports transmission takes care of power transfer. The dual-clutch transmission boasts fast gear changes with no loss of tractive force – in as little as 100 milliseconds. The driver has a choice of four different driving modes: "C" (Controlled Efficiency), "S" (Sport), "S+" (Sport plus) or "M" (Manual) along with a RACE START function. In the Sport, Sport plus and Manual modes the automatic double-declutching func-tion is active; all the modes can be selected conveniently via the rotary control in the AMG DRIVE UNIT. Opti-mum traction comes courtesy of the mechanical differential lock, which is in-tegrated in the compact transmission casing. The chosen solution with a front-mid engine plus transaxle configuration en-sures an ideal front/rear weight distribution of 47 to 53 percent. Mounting the engine behind the front axle has created the ideal conditions for con-summate driving dynamics with precise steering, first-class agility, low iner-tia with spontaneous directional changes and outstanding traction. The commitment of Mercedes-Benz and AMG to building an alluring super sports car that combines consummate racetrack performance with hallmark Mercedes long-distance comfort has given rise to an ingenious suspension layout. All four wheels are located on double wishbones with a track rod, a technology that has proven itself in motor racing, right through to Formula 1. With a double-wishbone axle, the wheel location and suspension function remain separate; the spring/damper struts are supported on the lower wishbone. The double-wishbone concept with its high camber and track rigidity positively locates the wheel with minimal elastic movements, providing the driver with an optimum sense of road contact when driving at the limits. Wishbones, steering knuckles and hub carriers at the front and rear are made entirely from forged aluminium – substantially reducing the unsprung masses; this configuration also notably improves the suspension response. The long wheelbase of 2680 millimetres not only results in outstanding straight-line stabil-ity but also low wheel load shifts, significantly reducing the vehicle's tendency to dive and squat. The broad track width – front 1682, rear 1653 millimetres – en-sures lower shifts in the wheel loads from the inner to the outer wheel when cornering, enabling the tyres to retain more grip. The large caster angle of 11.5 degrees significantly increases negative wheel camber when cornering and also improves tyre grip – this also ensures outstanding stability when braking heavily while cornering. The rack-and-pinion steering gear provides a consistently direct steering feel with a constant mechanical ratio of 13.6:1, in tune with the high expec-tations placed on a super sports car. The power steering provides speed-sensitive assistance and improves the feedback for the driver as the road speed increases: an indispensable factor for high-speed straight-line driving. Mounting the steering gear in front of the engine on the integral subframe enables the engine to be set down very low. The 'Gullwing' comes with 3-stage ESP® as standard, providing the driver with access to the three "ESP ON", "ESP SPORT" and "ESP OFF" modes at the push of a button. The re-sult is even more driving pleasure without compromising active safety at all. In "ESP OFF" mode too, operating the brake pedal restores all the normal ESP® functions. in a particularly dynamic style. The AMG high-performance braking system with composite brake discs at the front ensures extremely short stopping distances even under enormous loads. The newly developed, optional ceramic composite brakes with larger brake discs guarantee even better brake performance. The ceramic brake discs will perform reliably at even higher operating temperatures thanks to their greater hardness, all combined with an impressive weight reduction of around 40 percent. Reducing the unsprung masses has further optimised the handling of the 'Gullwing' – which pays dividends particularly when tack-ling fast bends on motorways. Lightweight construction was also key when it came to the wheels: weight-optimised AMG light-alloy wheels – 9.5 x 19 inch (front) and 11.0 x 20 inch (rear) – based on the innovative flow-forming principle reduce the unsprung masses while increasing driving dynamics and suspension comfort. In addi-tion to the standard-fit AMG 7-spoke light-alloy wheels, 5-twin-spoke wheels and 10-spoke forged wheels are available as an option. 265/35 R 19 (front) and 295/30 R 20 (rear) tyres developed exclusively for the SLS AMG ensure optimum performance. A tyre pressure monitoring system is fitted as stan-dard to permanently monitor tyre pressure in all four wheels; individual tyres are shown on the display. The reinterpretation of the legendary 'Gullwing' is scheduled to be launched in spring 2010. The sales price is EUR 177,310 (incl. 19% VAT). * provisional figures; ** according to VDA measuring method; *** electronically limited. For the first time in the company's history stretching back over 40 years, the Mercedes-Benz performance brand is presenting a vehicle developed in-house, the Mercedes-Benz SLS AMG. The super sports car serves up an exciting proposition with its unique technology package: aluminium spaceframe body with gullwing doors, AMG 6.3-litre V8 front-mid engine developing 420 kW/571 hp peak output and dry sump lubrication, seven-speed dual-clutch transmission in a transaxle configuration and sports suspension with aluminium double wishbones. The ideal front/rear weight distribution of 48 to 52 percent and the vehicle's low centre of gravity are testimony to the uncompromising sports car concept. The fine-tuned AMG 6.3-litre V8 engine achieves a peak output of 420 kW/571 hp at 6800 rpm, thus turning the SLS AMGinto one of the most powerful sports cars in its segment. A power-to-weight ratio of 2.84 kg/hp comes courtesy of the low vehicle weight. The eight-cylinder naturally-aspirated engine delivers maximum torque of 650 Nm at 4750 rpm. The 'Gullwing' accelerates from 0 to 100 km/h in 3.8 seconds, before going on to a top speed of 315 km/h (all figures are provisional). Bearing the internal designation M159, the V8 high-revving engine with its displacement of 6208 cubic centimetres has been thoroughly reengineered compared with the M156 entry-level engine and boasts all the hallmarks of powerful racing engines. The principal measures in increasing output include the all-new intake system, the reworked valve train and camshafts, the use of flow-optimised tubular steel headers and the dethrottling of the exhaust system. This results in much better cylinder charging, which feeds through into an increase in output to 420 kW/ 571 hp with maximum torque of 650 Nm. The eight-cylinder engine responds swiftly to movements of the accelerator pedal, demonstrating much more pronounced high-revving flexibility across the entire rev range. The switch to dry sump lubrication also translates into a much lower position of the engine in the vehicle. And lowering the vehicle's centre of gravity has also paved the way for high lateral acceleration and exhilarating driving dynamics. The use of high-strength components compensates for the increased engine load associated with the higher output. Forged pistons, a reinforced crankshaft bearing, optimised crankcase structure, along with improved lubrication thanks to an on‑demand high-performance oil pump ensure optimum durability. Sophisticated catalytic converter technology enables current and future exhaust emission standards such as EU 5, LEV 2 and ULEV to be met. The friction-optimised twin-wire-arc-sprayed (TWAS) coating on the cylinder walls – a process that remains exclusive to AMG– also reduces fuel consumption, as does the on‑demand, map-optimised oil supply along with the regulated generator management. Thanks to the targeted use of efficiency-enhancing measures, fuel consumption for the SLS AMG is around 13 litres of Super Plus per 100 kilometres (NEDC combined, provisional figure). The AMG6.3-litre V8 engine delivers its abundant power via an ultra-light carbon-fibre driveshaft at the rear axle – similar to the set-up used on the DTM C‑Class racing touring car. The transmission is mounted at the rear (transaxle principle) and is connected to the engine housing via a torque tube. The AMG high-performance composite brakes all-round ensure extremely short stopping distances even under enormous loads. The newly developed, optional ceramic composite brakes with larger brake discs guarantee even better brake performance and lower unsprung masses. The ceramic brake discs will perform reliably at even higher operating temperatures thanks to their greater hardness, all combined with an impressive weight reduction of around 40 percent. Light-weight design was also a key consideration with the wheels: weight-optimised AMG light-alloy wheels – 9.5 x 19 inch (front) and 11.0 x 20 inch (rear) - based on the innovative flow-forming principle reduce the unsprung masses while increasing driving dynamics and suspension comfort. 265/35 R 19 (front) and 295/30 R 20 (rear) tyres developed exclusively for AMG ensure optimum grip.